Don Walker and Olivia Yagy in “Tagged” by Jim Moss. Photo by Cliff Roles. 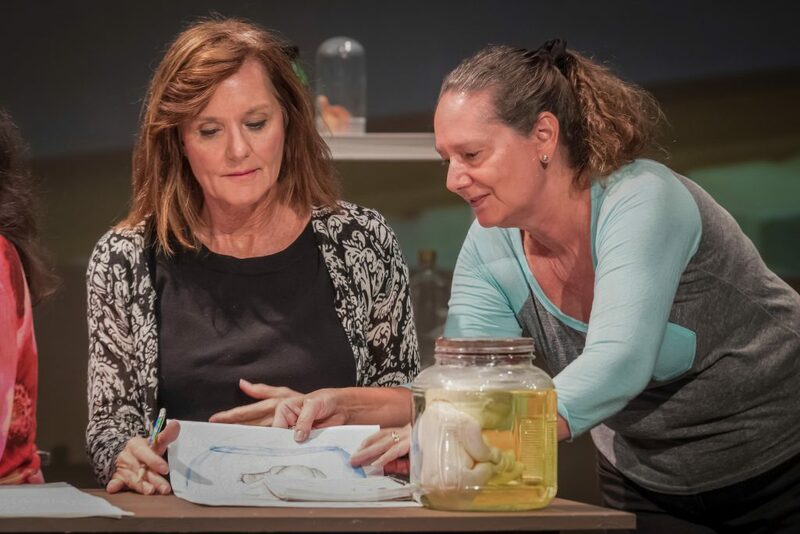 “Tagged” by Tampa-based playwright Jim Moss took the top prize – named “Best Play” and awarded $1,000, while “Motherless Child” by Louisiana-based playwright Peggy Aultman was named “Runner-Up” and received $500. The two winners were chosen from four finalists that were granted full productions at Glenridge Performing Arts Center November 1-4, 2018. The finalists were reduced from 12 semi-finalists presented as readings to the public. Over 100 plays from over eighty playwrights in twenty-six states were submitted to the playwriting competition open to U.S. playwrights. “Tagged” provides a frightening look at technology as a teenage girl agrees to be tagged with an artificially intelligent ankle cuff. “Motherless Child” is about a 40-something couple who are unable to conceive a child. The wife finds creative fulfillment in a university art class when she finds a jar containing a full-term female fetus in a nearby science lab. Pamela Hopkins and Tami Vaughan in “Motherless Child” by Peggy Aultman. Photo by Cliff Roles. The three distinguished judges for the finalist production included Dewey Davis-Thompson, Playwright and Regional Representative of Dramatists Guild of America; Peter Amster, Director and Choreographer at Asolo Rep; and Judith Tilton, Director of Cultural Affairs for Manatee County. The winning plays were directed by Carole Kleinberg and Ren Pearson.